A lava lamp is a decorative tube-shaped light fixture containing a colored, oily fluid that flows up and down throughout the lamp chamber in a manner reminiscent of molten lava. As the fluid rises and sinks in the lamp chamber it changes shape and breaks into globules of various sizes, giving a psychedelic effect of constantly shifting patterns. Credit for the creation of the lava lamp is given to English engineer Craven Walker who, in the late 1940s, saw a prototype of the lamp in a pub in Hampshire, England. This early version, according to the Walker legend, was made of "a cocktail shaker, old tins and things." He purchased the liquid-filled fixture and set out to make his own. Walker formed the Crestworth Company in Dorset, England, and over the next 15 years tried to build a better lava lamp. When first marketed under the name Astro Lite in British stores in the early 1960s, it was not an immediate success. Then, at a 1965 German trade show, two American entrepreneurs saw an early model on display, and bought the rights to manufacturer the lamp in North America. In the United States, they changed the name from Astro Lite, to the infinitely hipper Lava Lite Lamp and began manufacturing operations in Chicago. With the advent of psychedelia and pop-art later that decade, Walker's gimmicky contraption became a major fad. By the time Walker left the business in 1990, he had sold over seven million of his creations. Today, the company ships 400,000 lamps a year to shops around the world. Currently, Haggerty Enterprises is the only U.S. manufacturer of Lava Lite Lamps and they distribute them nationally through a number of retail and mail order outlets. The lava effect is due to the interaction between the fluids used in the lamp. These fluids are selected on the basis of their density so one tends to barely float in the other. In addition, they are chosen based on their coefficient of expansion, so as they are heated one tends to rise or sink faster than the other. When heat from the light bulb warms the heavier liquid sitting on the bottom, it gets hotter and, due to its lower density, rises to the surface. By the time the "lava" reaches the top of the lamp, it begins to cool, becomes denser, and sinks to the bottom. As the lava sinks, it gets closer to the light bulb, heats up again, and the process is repeated over and over. Therefore, the key to successful lava lamp design is the selection of appropriate immiscible fluids. The exact composition used in lava lamps is a proprietary secret, but in general terms, one fluid is water based and the other is oil based. The aqueous phase may be water mixed with alcohol or other water-soluble solvents. The second fluid must meet a number of design criteria: it must be insoluble in water, heavier and more viscous, non-reactive and non-flammable, and reasonably priced. It must also be non poisonous, unchlorinated, not emulsifiable in water, and must have a greater coefficient of expansion than water. While fluid selection does not change from lamp to lamp, there are design changes to be considered because lamps are available in different colors, sizes, and styles. The original Century model, which is still manufactured today, was the most popular model during the 1960s and 1970s. Its gold base is perforated with tiny holes which simulate starlight and its 52 oz (1.46 kg) globe is filled with red or white lava and yellow or blue liquid. A number of interesting variations on the Century have been manufactured in past years, although not all of them are still made today. For example, the Enchantress Planter Lava Lite lamp came equipped with plastic foliage. The Continental Lava Lite lamp which, was the only cordless, non-electric model, featured a candle to warm the lava. The Consort Lava Lite lamp, according to the company's 1970s catalog, was designed with a more masculine look "perfect for the study or den, so right for the executive suite." There was also the Mediterranean Lava Lite lamp, which was decorated with black wrought iron. In addition, Haggerty offers so-called giant lamps, which range in size up to 27 in (68.6 cm) tall. As noted above, the actual ingredients used in Lava Lite Lamps are proprietary but there are several liquid ingredients, which can be combined to give a lava effect. Lava-type lamps can be made with water mixed with isopropyl alcohol as one phase and mineral oil as the other. Other materials, which may be used as oil phase ingredients include benzyl alcohol, cinnamyl alcohol, diethyl phthalate, and ethyl salicylate. Other additives used in lava lamp fluids include various oil and water-soluble colorants. The specific gravity of the aqueous phase can be adjusted through the addition of sodium chloride or similar materials. In addition, a hydrophobic solvent may be added to the mixture to help the lava coalesce. Turpentine and similar paint solvents are said to work well in this regard. Antifreeze ingredients can also be added to increase the rate at which the lava warms. 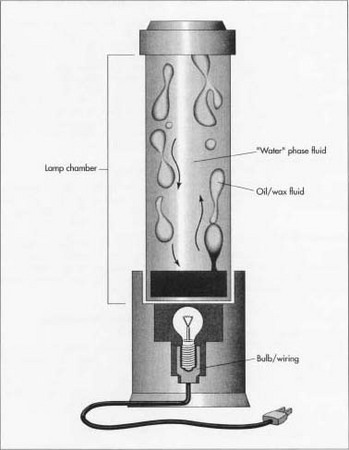 A clear glass cylinder is used to house the fluids and forms the body of the lamp. The classic lava lamp shape is an hourglass about 10 in (25.4 cm) high. A regular incandescent bulb is used as the source for both light and heat in a lava lamp. The type of light bulb is critical to ensure the lava is not over or under heated. Haggerty Enterprises lists several bulb types that are appropriate for their appliances, depending on which the model: 40 watt frosted bulb, 100 watt reflector bulb with inside frost, 7.5 watt bulb 40 watt candelabra type. Although it does not generate at much heat, a florescent bulb is used in their Pacifica model. Other items used in lava lamp production include the base plate, which houses the electrical components, 16-gauge lamp wire, and an electrical plug. Quarter inch (0.635 cm) thick foam rubber may be used as a gasket material to seal the chamber. Miscellaneous hardware, such as screws, is also used. Optional equipment, such as a light dimmer switch or a small fan, may be used for temperature control. The manufacturing process of the lamp consists of several steps, both automated and manual. According to a representative of Haggerty Enterprises, the company has the capacity to produce up to 10,000 lamps per day on their assembly line. 1 The glass cylinder is fastened to the ceramic lamp fixture, which forms the base. The lamp is attached to the appropriate wiring and the bulb is screwed into place. The gaskets are glued into place to prohibit leakage. The containers are assembled and checked to make sure they are leak proof. A lava lamp is made by mixing alcohol and water and mineral oil and dyes, combining each separately. By mixing water and alcohol in the correct proportions, the mineral oil can be made to float. The correct ratio is about six parts 90% isopropyl alcohol to 13 parts of 70% isopropyl alcohol. Dyes, salt, etc. are then mixed into the water phase, and the oils and waxes are added to the second liquid. sink to the bottom. The addition of 70% alcohol will make the oil seem lighter until it is about to "jump" off the bottom. The correct ratio is about six parts 90% isopropyl alcohol to 13 parts of 70% isopropyl alcohol. Dyes, salt, etc. are then mixed into the water phase, and the oils and waxes are added to the second liquid. Some heating may be required to melt the waxy materials. 3 The lamps are moved along a conveyor line and first filled with the oil/wax phase, then the water phase. A small air-space of about 1 in (2.54 cm) is left at the top to allow for expansion of the hot liquids. This important because the amount of airspace can influence the size of the bubbles formed by the lava. After filling, the cylinder is capped with either a screw type cap or a bottle cap type, which is crimped into place. During the batching and filling processes, the liquids are checked to ensure they were correctly manufactured. The proper ratio and composition of the two liquid phases is critical to ensure that the lava effect will be achieved. An incorrect ratio may allow the oil and water phase to mix together, separate into bubbles which are too small, rise and fall as one continuous mass, or become mixed with the water and not separate at all. It is critical that all electrical connections are good and seals are tight to ensure safety and that there are no leaks. Improper gasket alignment or poor seals can result in leakage of the fluids. After filling, each lamp is checked to ensure the light bulb is completely centered and tightened. The bulb and socket may move slightly during shipping. If so, the owner is instructed to gently push the socket back to the center of base. Instructions on how to change the bulb are provided inside the lamp socket base. Variation in lamp size or wattage may yield unsatisfactory lava flow and may increase the risk of fire. During initial use, the lava may not flow properly or may float to the top of the globe. If this happens, the lamp should be allowed to heat up for four hours or more to allow the lava material to become completely molten. Excessive agitation of the lamp may cause the fluids to intermingle and become cloudy, or may even result in permanent malfunction. The lamp should not be stored in direct sunlight as this may cause the colors to fade. Given the proprietary nature of lava lamps, it is difficult to speculate on future improvements in the manufacturing process. However, it is interesting to note that computer technology has spawned its own version of the lava lamp—the virtual lava lamp. Also known as the Javalamp after the popular computer language, this virtual lamp is a computer animation that mimics the appearance of the real item. Popular Electronics Hobbyists Handbook. Germsback Publications Inc, 1992. Haggerty Enterprises Inc. Chicago, IL. I must thank for this illustrative and very good narrative article. I wanted to know it as "Feng Shui" suggested me to use 'lava Lamp' as I need to rejuvinate my dauthers education and Fend Shui suggests this for Graduates room. I am buying it today. Please inform of me any more articles updates.